Welcome to K&C Canine Life Skills LLC! We are Kayla Delp, CCDT and Crystal, Canine Partner. 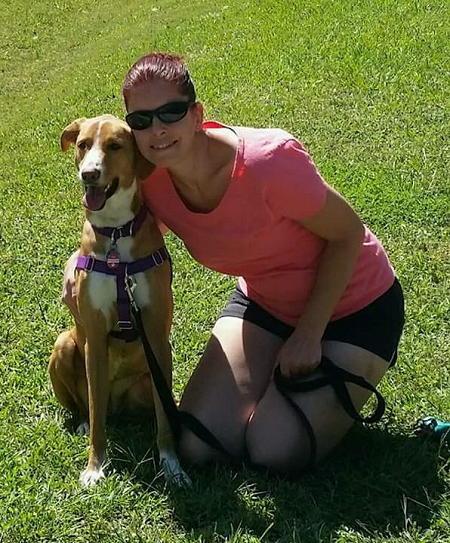 My journey into dog training began being a volunteer at Animal Friends in Pittsburgh, PA. During my time at Animal Friends I was a dog walker, dog training assistant, and assisted at public events. Learning foundation skills at an animal shelter taught me hands on experience how to assist dogs with varying personalities. After relocating to North Carolina I began my dog training education at CATCH Canine Trainers Academy enrolled in the Master Class program to earn my Certified Dog Trainer certification. My education includes having learned about dog developmental stages, behavior problem solving, canine learning theory, and obedience training. In May 2018 I completed the Master Class program and became a Certified Dog Trainer. While working through my dog trainer certification I was also training my Canine Partner, Crystal. She expanded my original goals to include now specializing in canine behavior cases. My original plan was to simply work with people teaching their dogs basic obedience. Crystal changed all of that when she introduced me to behavioral issues that included anxiety, aggression, leash reactivity, fearful of people and life in general. As I progressed through dog trainer education and training it only made sense that Crystal be part of my dog training success and business. Together, Crystal and I have formed K&C Canine Life Skills LLC. Our company is built on three core principles: heart, soul, and honesty. We have heart that I understand both the human and canine sides of training challenges and behavioral issues. We have soul that while clients will never meet Crystal in person due to her fear aggression issues, she is always there in spirit to inspire and guide me. We are built on honesty that I will be honest with you about yours’ and dog’s individual dog training needs. Our mission is to help dogs remain with their forever families and helping humans to learn how to understand their canine companions. I have found that many clients get that “light bulb moment” and their relationship with their dogs changes forever. While you will never meet Crystal keep in mind that she enjoys hearing the stories about our clients by showing me her happy doggy smiles. Thank you for having read the story of K&C Canine Life Skills LLC. We look forward to the opportunity to work with you and your dogs.